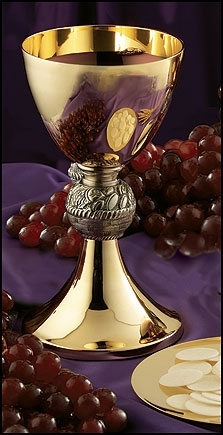 Item: #JC718 Material: Nickel Plate, 12 oz Size: 4" Dia x 8" H, 5" Dia Paten Availability: In Stock Our Loaves and Fish Chalice and Paten was exclusively designed and manufactured using only high quality materials. Each piece is crafted of lead-free, 100% food safe brass and then gold plated to meet our high quality standards. An etched loaves and fish node in an antique silver finish was added to create a very unique look. It is truly an exquisite set at an unbeatable value. 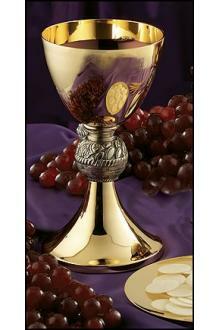 All chalices, ciboria and patens are made of lead-free, 100% food safe brass then gold plated.